What? Another update on the same evening? Yup! When I was looking through the packages that had arrived the past week, I found that I had my B4m Switchcraft connectors that I had put to the side and almost forgot about. 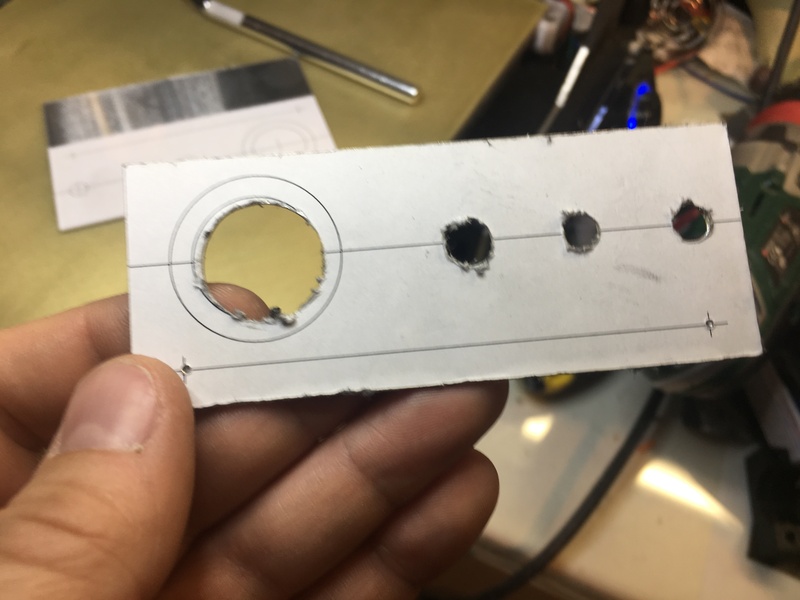 So, armed with those (got charging plugs and toggle switches on the way) I decided to start working on my charging plate for my Proton Pack. I have already decided to go with the “Spengler version”, so the Spengler charging plate it is! 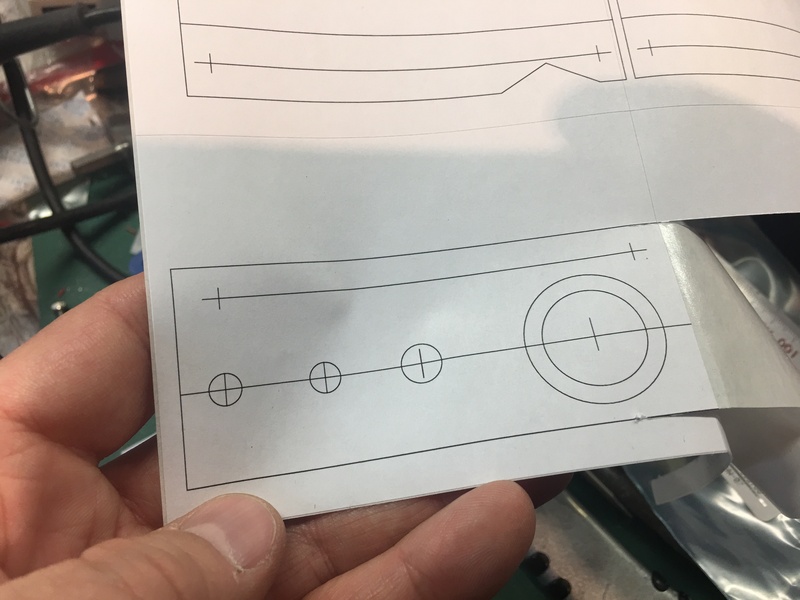 I found a sales thread on the forum that had a pretty clear image of this, and knowing the size of the Switchcraft connector, I estimated the size of the plate itself to be 4 cm high by 10 cm long. 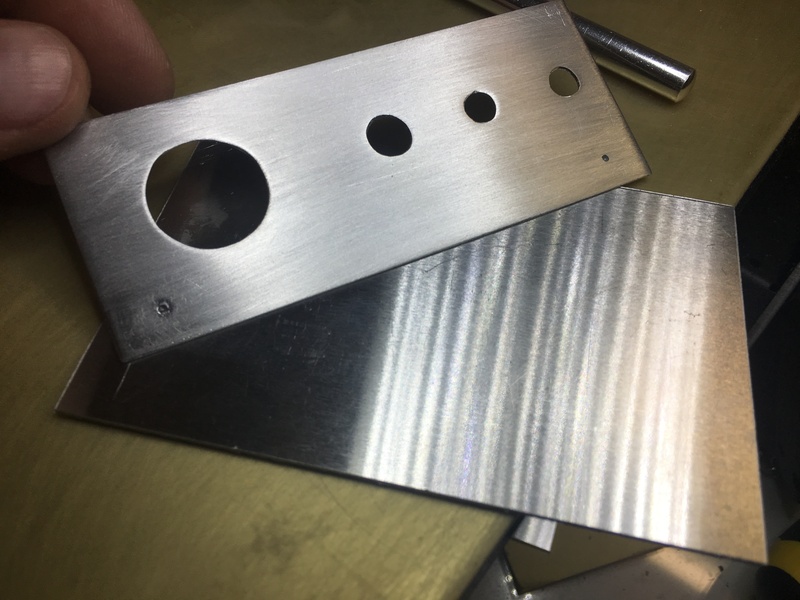 In addition to this, there is also an angled plate that is riveted against the larger plate. Not having any proper metal working tools, I had no idea ho to do this one yet. More on that later. 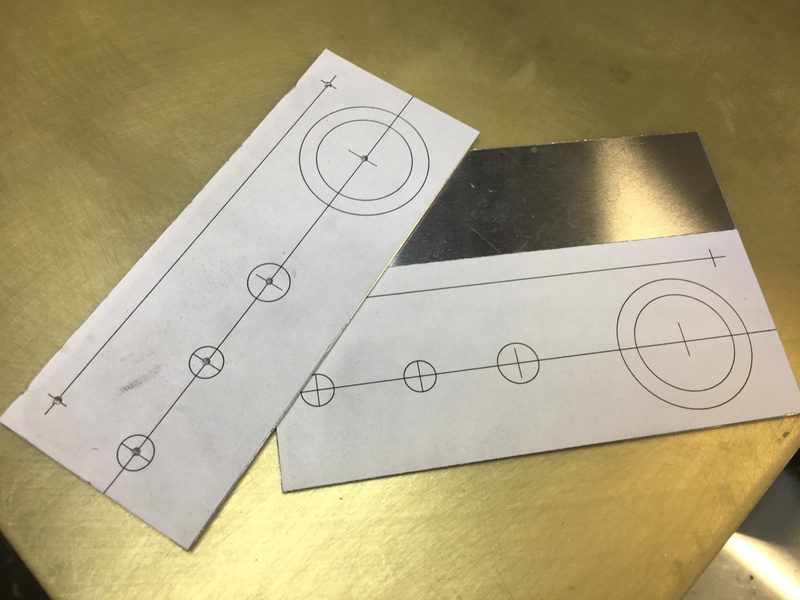 So, I quickly drew something in my CAD program, exported to an image file and printed out the pattern on self-adhesing labels, and stuck these on some 0.8mm aluminium plate I had laying about from other projects. Cutting these out is easy. I simply use score and snap, but hen it comes to aluminium, I need to score a lot, deep and hard with my break blade knife. 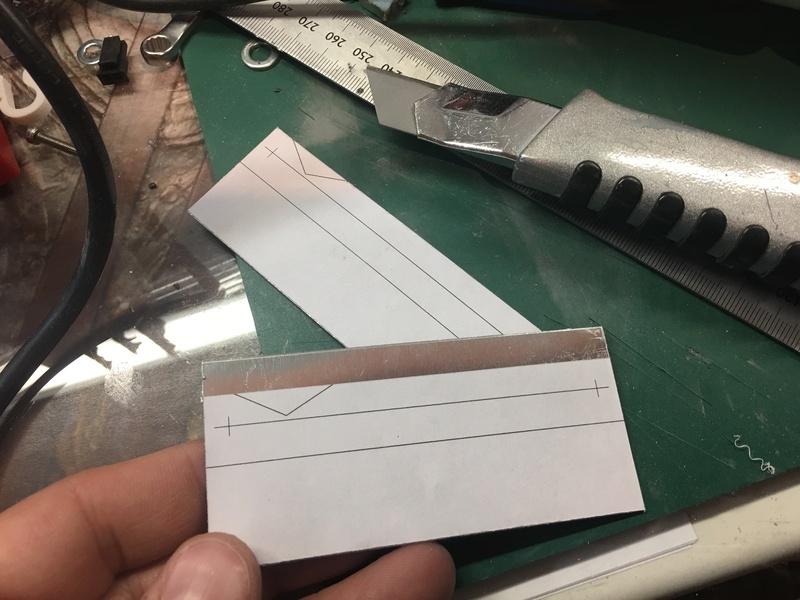 Once I can see a hint of the cut on the back side, I can simply push down on a flat surface at an angle, and the piece will bend right where I scored it. Bending back and forth a few times and I have a perfect cut! Works every time! Next step is to use my metal awl punch and mark out those holes and start drilling. The Switchcraft connector needs about 20mm hole to fit through, the charging plug 8mm, and the switch that I plan on using, 6mm. So, the hole did not get 100% centered. I drilled it holding it in my hand with a step drill, so not very surprised. However, it is not as bad as it seems, and in the end, you won’t be able to tell the difference anyway. 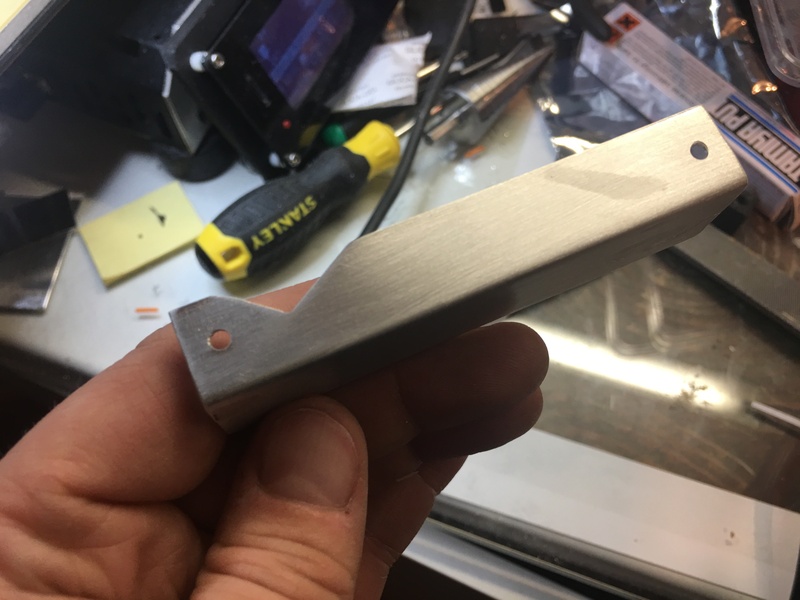 Once the holes were done (I had to make the large hole even larger when test fitting), off to wet sand both front and back side to make that nice, brushed aluminium look. Compare this to the raw metal in the background! 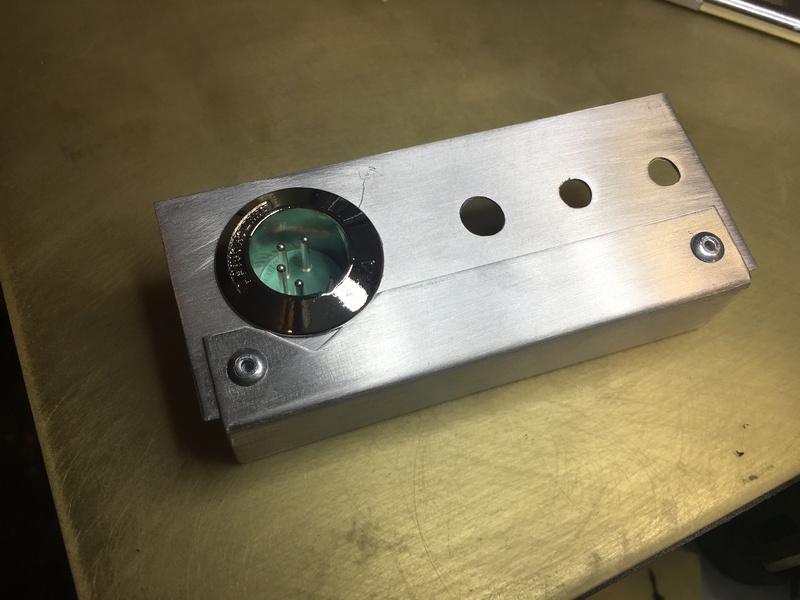 Next step was to make the small angled plate that would be riveted to this. Same procedure here. Cut with score and snap, then drill time. 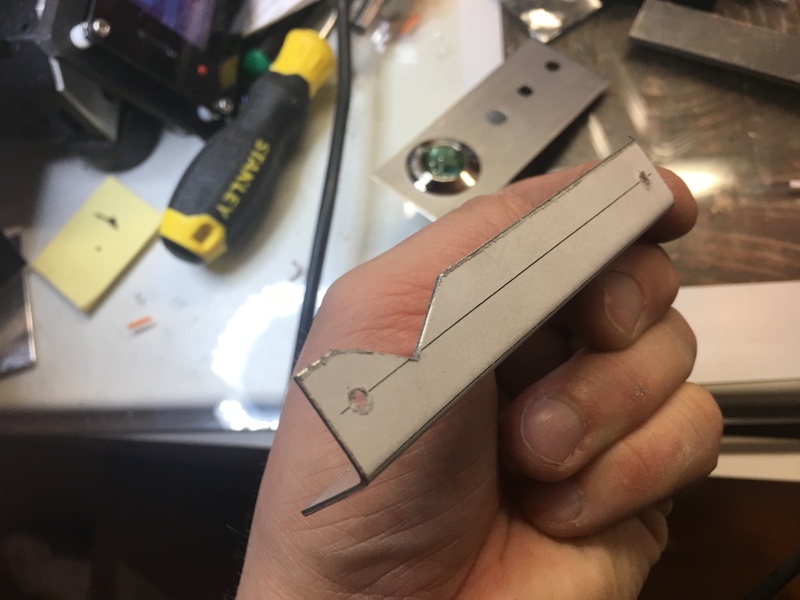 Once it was cut out and drilled, I had to make a 90 degree straight bend somehow. I ended up fixing the metal to a piece of wood with a teel ruler and clamped it down heavily. I then gently starting pushing down towards the wood in order to make the portruding part bend. Once I had a bend at a big angle enough, I simply put the piece of wood with the clamped down piece and pushed it straight down at a 90 degree angle. Worked like a charm! Now I’m just waiting for the final parts to arrive, and tomorrow I’ll make another one for a friend.